Amy Jo has a knitting sewing project, and she’s recruiting help. Hello everyone! I have a favor to ask. Would you mind digging through your closet(s) to see if you have any 100-percent wool sweaters that you are willing to donate to a good cause? I hope to make 100 pairs of felted wool mittens by Christmas to donate to local senior, women’s, and homeless organizations. One medium-sized woman’s sweater will make one pair of adult mittens and at least one pair of child-size mittens. It doesn’t matter if the sweater is tatty or has holes in it, or if you’ve washed and shrunk it somewhere along the line (that would actually help me save the step of “felting” the sweaters before making the mittens). And, if you are feeling ambitious and would like to join me in the sewing of mittens, I’ll gladly send you the template and instructions. They are very easy to make — only one seam! If you’d like to contribute to Amy Jo’s mitten extravaganza, leave a comment here or drop me a line. Also: I’ll happily ferry old sweaters, if needed. Thanks for posting this JD. I really appreciate it. And, to clarify, this is a sewing project not a knitting project. I felt the sweaters by washing them in hot water and then cut out the pattern and sew them up. Also, the sweaters can have a bit of nylon in them, and any type of woolen fiber will work–lambswool, alpaca, cashmere, etc. I’m also finding that I can often get at least four pairs of mittens per sweater since I am making five different sizes (2 adult and 3 childrens). Just let me know where to send them. I probably have several I can send on. I would be interested in the pattern and instructions. If I am successful in making my first pair, I would like to make some for charity. I think local thrift stores would be a good source for wool sweaters you could use for this project., sometimes you can pick them up for a couple of bucks. and mittens (crocheted) in the past. I have been collecting used sweaters for the very same project to dontate to charities. I have been looking for a good pattern and I like yours. Please send me a copy of your pattern & I will do my part to keep hands and hearts warm all winter in Minnesota. Can you please send me the template for the mittens? My wife would like to sew some up. Thanks in advance! Just saw these made at a craft show. What a fun idea for charity. Would love to help if you can send the info. I would love to have the pattern for making felted wool mittens. A friend and I have been looking for the pattern. This would be a great charitable project! Please could you send me your template. We have a mitten tree in our village and these would be great. I would like the pattern. I’ve been collecting sweaters, but need the pattern to make the mittens. Thanks. I would love to help make some mittens and learn how to recycle those old tatterd sweaters at the same time. whats the criteria required to recieve a template. I see christmas is soon to come, but perhaps I can still help. are you there yet, to 100? Does anyone have the mitten template to the one seam mitten? I have several old sweaters that I have already felted and would like to donate to the cause. I know that Christmas is over, but if you’re still interested…. Thanks everyone for your interest in the mitten project. I am pleased with the interest folks have shown in the project. I don’t have a total count for mittens since I sent the pattern off to a number of folks around the country, but within my family we made nearly 200 pairs! The agencies we took them to, including Portland Impact, were genuinely pleased to receive them. I encourage folks to keep making them even though the holidays are quickly passing. It is easy to make a template, just trace your hands and photocopy the sketch at 115 to 120 percent. To felt the sweaters, wash them in hot water with a spoonful of liquid detergent. You may have to wash them more than once. Throwing in a pair of jeans will speed things up. Once the sweaters have felted to your liking, toss them in the dryer. Cut the mittens out (I like to use the ribbing on the bottom of the sweater for the wrists) and sew them up. i would like the pattern to help a neighbor. I would very much appreciate this pattern. I do much donating to the Humane Society. I’d also love to work on this great project. I’m thinking of children’s mittens for local schools… you wouldn’t believe how many kids come to school without hats and mittens! Please send pattern. Thank you for this project idea! First time trying this….you mean I could also ask for the pattern for the mittens? Thank you. I’ll chime in on wanting the pattern. I have three wool sweaters waiting to become mittens and/or slippers. BTW, a slipper pattern, or link to one, would be greatly appreciated, too. Lovely mittens,I am interested in your pattern…recyling makes it an even more attractive project. Great idea. I have a stash of old wool sweaters that I felted for a blanket project that failed. This might be a fabulous use of the sweaters and a great charity item. Thanks. 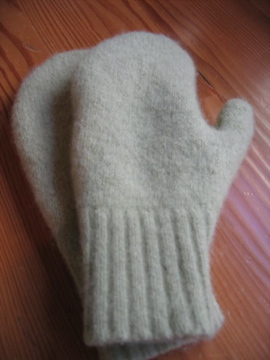 I would love to have template for the felted, one-seam wool mittens. I want to start felting, but want something easy to begin with. Could you possibly send me the template?? I tried to do one but the thumb was tooooo skinny. How many mittens have you collected?? I would love the pattern for the felted wool mittens made from old sweaters. I would greatly appreciate anyone emailing this to me and thanks so much in advance. I would appreciate receiving the directions and pattern to make the mittens. Thank you in advance. Yes, I would LOVE receive the directions and pattern to make the mittens. Thank you for the info. Peace bee with you. This is an amazing idea!Please send me the mitten template,and I will join the mitten project . I would love the instructions and pattern for the mittens. If you have any other patterns I would love to have them as well. Wow! How fun is that! Could you please send me the pattern? I will ask the folks at church for donations and help make mittens for our town–we live in a town where the kids really need warm stuff! thanks in advance–congrats on making and breaking your goal! This is such a great idea. I know our elementary school is always looking for hats and mittens for the kids that don’t have them. I would love the pattern to be able to make them to donate to the school if you could send me the pattern. I would love the template to make these mittens. We have a women’s retreat and this would be a great project for our Winter gathering. Hi, you must be an awesome person! I have an old sweater that my mom made 50 years ago. I would love to make her granddaughters memory mittens from this sweater. After that (if they turn out ok) I will join you in your venture for charity. thanks for the pattern. I have several sweaters that I have felted and would love your pattern. Thanks! I just purchased 3 100% wool sweaters at the thrift store and this would be a wonderful use for the sleeves! Please send the mitten pattern! I would very much appreciate the mitten pattern. I would like to try my hand at making these. Thank-You! I would love to receive the pattern and try making some for charilty. This is a wonderful idea! Does anyone have a mitten pattern for kids? I could try tracing a hand, but I saw someone else said the thumb was too skinny. We have so many kids around here that come to school w/o mittens. I’d love to help out. I would love your mitten pattern to make these for charity as well. What a great project! I would love to make the mitten pattern for some a sub for santa project. May I have your knitted mitten pattern? I want to make them for my children! Thank you! Great job!